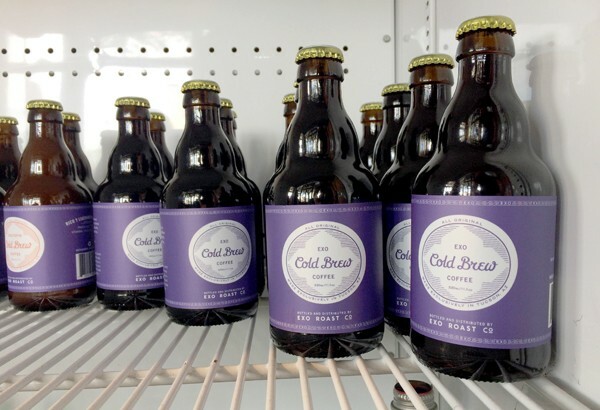 Get your cold brew in a bottle now at EXO Roast Co. If you're anything like me, you like your locally-roasted coffee and you like it every day. Sometimes it's hard to make that time commitment to the third wave on a busy day, but, luckily, EXO Roast Co. has a solution for you time-crunched, Type A coffee shop junkies. EXO just started selling two varieties of cold brew in bottles for a little over $4 including tax at their cafe and roastery located at 403 N. Sixth Ave. The regular cold brew and chiltepin and chocolate bottles are available at Tap & Bottle, Food Conspiracy Food Co-Op and the Rillito Park Farmers Market this week as well. Coffee, of course, is great and EXO does a beautiful job roasting, but the real showstopper here is the bottle chocolate and chiltepin cold brew. Made simply with coffee, cream, dark chocolate and chiltepin chilis, the flavors are extraordinarily well balanced, with not too much heat, cream or cocoa to overpower any of the other elements. I wouldn't blame you if you started a small stockpile of those in your fridge for emergencies. It's not just about the flavor with these bottles, either, as the Saywell-designed packaging is so gorgeous and clean that you'll want to show it off between glugs around town.